Just about done with Ashlee's room!! 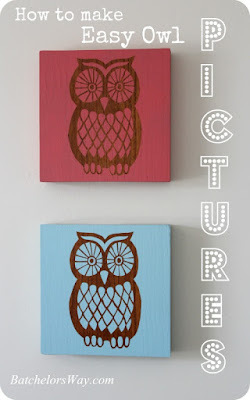 Today I want to show you some super cute, super easy artwork we made. Ashlee actually helped me with this project. 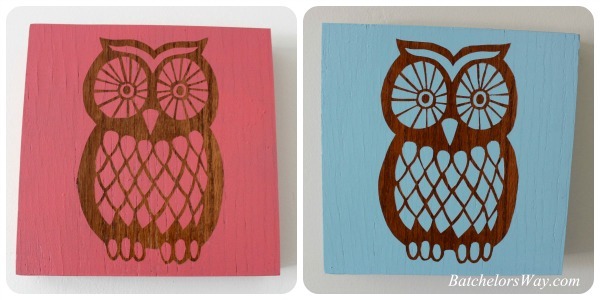 Ashlee and I have a thing for owls lately. Don't you just love these cute ones? They are easy to make and you could use any color you want or any picture you want. Now that I know you want one let me know and Ashlee will make you one for a small fee. But if you want to make your own, here's what we did. 1. We cut 8 inch squares from 1/4" thick oak plywood. 2. Next we covered the board with leftover pieces of vinyl. Often I end up with vinyl scraps that aren't big enough to be used in my Silhouette. You will notice below that we used a white and red scrap. It only has to be as big as your design. 3. Make sure the vinyl is firmly stuck to your board. Cut it down and center the design where you want it to be on your board and then tape it in place. 5. Once everything is firmly attached, start cutting out your design with an X-Acto knife. Push hard so you cut through the paper pattern and the vinyl. After each section is cut, just pull it out. We altered our pattern a little. We cut larger openings in the eye area and enclosed the toes. We made sure to cut all the little inside parts first and the out line last, to keep the pattern in place. 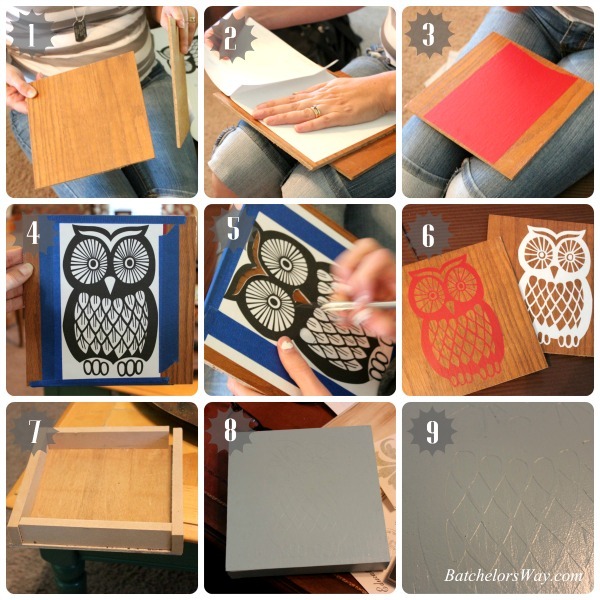 You could also just cut out a picture on your silhouette, but we couldn't find any owls Ashlee liked. This is just another way to use any pattern you find. 7. Next we cut thin scraps of 1/2" MDF to create a box. Again you can use any wood scraps. Once they were all cut to size, we glued and clamped them in place. 8. Once the glue was dry, we painted the boxes. We painted one blue and one coral. Two coats right over the vinyl pattern. 9. After your paint dries, just peel off the vinyl. Which will reveal the wood underneath. 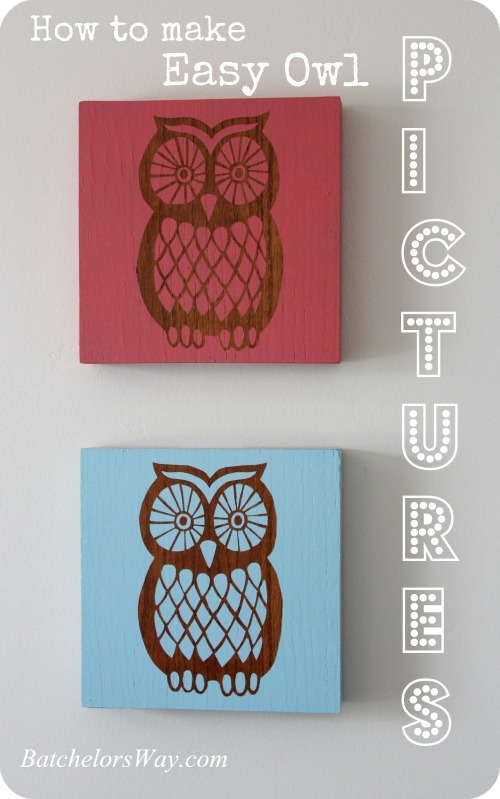 Then sit back and admire your cute owls!!! She said it's addicting. They add a cute pop of color and design to her room! Best thing is they cost me nothing and I used up leftover supplies. Leftover vinyl, leftover wood, leftover paint. Can't wait to show you them in place!! !